Looks around and idles about. Occasionally sits down, balances on its toes, and rarely roars. From November 2, 2018 through December 31, 2018, 100% of the adoption fee will be donated to Code.org, a nonprofit organization. Hits the enemy with a ball of snow, dealing 394 Elemental damage. The Flash Freeze and Deep Freeze combo make Whomper a great addition to your line up. Will devestate mechs, and is a great finisher against most types of pets. He's saved the day on me a few times against some nasty trainers. He also works well in PVP. Doesn't get counted as learned in collection, possibly Blizzard API bug. 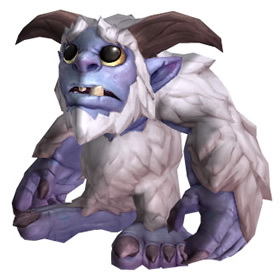 Whomper is 1 of only 3 battle pets to have Flash Freeze and 1 of only 5 pets to have Deep Freeze. He is the only pet to have both Flash Freeze and Deep Freeze in different slots. Playful Frostkin has both abilities, but in the same slot and cannot be used as a combo. When used in combination, Flash Freeze followed by Deep Freeze, Whomper averages 770 damage to non critters, slows, and stuns the target. Versus mechanical, Flash Freeze-> Deep Freeze -> Snowball averages 1575. Just purchased and levelled this pet, cant find much info on him anywhere yet so here are the specs for anyone considering a purchase. 1546 hp, 260 attk, 289 speed at level 25. No unique interactions that I've found. He is a pretty large pet, about the size of a gnome.